Mars II LED Grow Light 400W 700W 900W 1200W 1600W Full Specturm Panel Indoor Plants Veg Bloom Lamp. Wareshouse and repair center are avaiable. Certificate of plug: Safe to use(UL, BS, DVE, SAA, PSE, Approvel). Seeding / Breeding/ Veg/ Flower/For all planting stages / Green Vegs / Flower Plant / Fruit Plant / Herbs / Medical / Meat Plant etc 2. Hydroponics / Horticulture / Indoor plants / Greenhouse Lighting / Pot Culture / Farm / Water Soluble Breeding / Pipeline Cultivation etc 3. Exhibition / House Garden / Bonsai / Home / Commercial Crops / Project / Personal Growing / Urban and University Research ect. Mars II 400W LED Grow Light Hydro Full Spectrum Lamp Veg Flower Panel Lamp er. Upgraded Brand new and High quality. Mars II 400W LED Grow Light Veg Flower Plant Lamp. Feature: Full spectrum+Veg and Bloom Switches+2 IR leds+Quality Parts(Aluminum PCB+ Cooling Fans). Easy to set, low use cost, can work with timer to control working time. Spectrum: White, 430440nm, 450475nm, 620630nm, 650670nm, IR 730nm (12 Band Spectrum)Full Spectrum outout for all stage of your plant growth and bloom. LED Diode Quantity: 80 pcs. LED Brand: High efficiency 5W Epistar (HI-LED) High Intensity. Power Consumption for each Unit: 188W±15%. Amp: 1.8A/110v; 0.88A/220v. Product Dimensions(L/W/H): 14''×14''×3.5''=34×34×9 cm. Recommend Coverage Area for Per Unit: 3'×3'=92×92 cm(Veg). Recommend Coverage Area for Per Unit: 2.5'×2.5'=72×72 cm(Bloom). Max Coverage at 24 Height for Per Unit: 3.5x3.5ft=107x107cm. Lens View Angle: 90°/120° Mixed. Net Weight: 11.82lbs/5.36KG. 1 X Newest Mars II 400W LED Grow Light LED Panel. 1 X Free 6.6ft Power cord with Plug, Plug Type :US, EU, UK, AU, Japan. 1 X Free Steel hanging kits. This listing is for 1PCS of Mars II 400W so you will get 1 light. Mars II 700W Led Grow Light Hydro Veg Flower Panel Plant Growing Lamp. Model: Mars Hydro Mars II 700W Led Grow Light Lamp Full Spectrum Indoor Hydro Hydroponic IR. Feature: Full spectrum+Veg and Bloom Switches+3 IR leds+Quality Parts(Aluminum PCB+ Cooling Fans). Spectrum: White, 430440nm, 450475nm, 620630nm, 650670nm, IR (12 Band Spectrum)Full Spectrum outout for all stage of your plant growth/bloom. LED Diode Quantity: 140 pcs. Power Consumption for each Unit: 321W±10%. Amp: 2.68A/110v; 1.42A/220v. Noise Level: 58.7 DB. Product Dimensions(L/W/H): 15''×15''×3.5''=38×38×9 cm. Recommend Coverage Area for Per Unit: 3.5'×3.5'=107×107 cm(Veg). Recommend Coverage Area for Per Unit: 3'×3'=92×92 cm(Bloom). Max Coverage at 24 Height for Per Unit: 4x4ft=122x122cm. 1 X Newest Mars II 700W LED Grow Light LED Panel. This listing is for 1PCS of Mars II 700W, so you will get 1 light. Mars Hydro Mars II 900W Led Grow Light Veg Flower Indoor Plant Hydroponics. Model:Mars Hydro Mars II 900W Led Grow Light Lamp Full Spectrum Indoor Hydro Hydroponic IR. Feature:Full spectrum+Veg and Bloom Switches+4 IR leds+Quality Parts(Aluminum PCB+ Cooling Fans). Spectrum: White, 430440nm, 450475nm, 620630nm, 650670nm, IR 730nm (12 Band Spectrum)(Most Appropariate light proportion for increasing the yields of Commericial cultivation)Full Spectrum outout for all stage of your plant growth and bloom. LED Diode Quantity: 180 pcs. Power Consumption for each Unit: 420W±10%. Amp: 3.25A/110v; 1.75A/220v. Product Dimensions(L/W/H): 17''×17''×3.5''=42×42×9cm. Recommend Coverage Area for Per Unit: 4'×4'=122×122 cm(Veg). Recommend Coverage Area for Per Unit: 3.5'×3.5'=107×107 cm(Bloom). Max Coverage at 24 Height for Per Unit: 4.5x4.5ft=137x137cm. Cetification: ETL, UL, RoHS, CE, SAA, PSE, 100% Safe guaranteed! Net Weight: 19.2lbs/8.71KG. 1 X Newest Mars II 900W LED Grow Light LED Panel. This listing is for 1PCS of Mars II 900W, so you will get 1 light. Mars II 1200W Led Grow Light Lamp Full Spectrum Indoor Hydro Hydroponic IR. Model:Mars Hydro Mars II 1200W Led Grow Light Lamp Full Spectrum. LED Diode Quantity: 240 pcs. Power Consumption for each Unit: 552W±10%. Amp: 4.44A/110v; 2.43A/220v. Product Dimensions(L/W/H): 18''×18''×3.5''=46×46×9cm. Recommend Coverage Area for Per Unit: 4.5'×4.5'=137×137 cm(Veg). Recommend Coverage Area for Per Unit: 4'×4'=122×122 cm(Bloom). Max Coverage at 24 Height for Per Unit: 5x5ft=152x152cm. 1 X Newest Mars II 1200W LED Grow Light LED Panel. This listing is for 1PCS of Mars II 1200W, so you will get 1 light. Mars II 1600W Led Grow Light Lamp Full Spectrum Indoor Hydro Hydroponic IR. Model:Mars Hydro Mars II 1600W Led Grow Light Lamp Full Spectrum Indoor Hydro Hydroponic IR. LED Diode Quantity: 324 pcs. Power Consumption for each Unit: 749W±10%/110V, 732W±10%/220V. Amp: 6.54A/110v; 3.46A/220v. Product Dimensions(L/W/H): 20"x20"x3.5=52x52x9cm. Recommend Coverage Area for Per Unit: 5'×5'=152×152 cm(Veg). Recommend Coverage Area for Per Unit: 4.5'x4.5'=137x137 cm(Bloom). Max Coverage at 24 Height for Per Unit: 5.5x5.5ft=168x168cm. 1 X Newest Mars II 1600W LED Grow Light LED Panel. 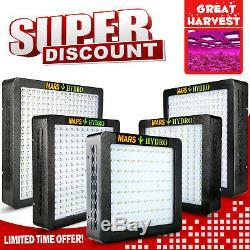 This listing is for 1PCS of Mars II 1600W, so you will get 1 light. 1 LED grow light supplier. We have our own researching, designing, developing, producing and testing team to support our great product. 100% authentic Mars Hydro led light. Hope to get your understanding. It will encourage us doing better, no matter the quality of the products or after sale service. Don't forget that good communication can solve all problems. Any questions, please feel free to send message to us first. We are always here to help you. A: If the light has issues within 3 month, we send you free replacements parts and insctuction video for repair or you return it to our service center for repair. B:After 3 months, we send you free parts for repair. A: Up to 20% of LED diodes B: Up to 30% of the power supplies. Topledfactorystore will always try our best to solve the problem for you. 1Are these items authentic Mars Hydro? Yes, they are 100% real and authentic of Mars hydro. We directly get them from factory with excellent quality and competitive price more than 7 Years. Customers in Australia will receive an AU power cord. The item "Mars II 400W 700W 900W 1200W 1600W LED Grow Light Full Specturm VEG FLOWER Plant" is in sale since Tuesday, September 12, 2017.